I spent most of yesterday at the showrooms ordering goods for the shops. That always makes me work up an appetite! I knew I wanted to make Parmesan/Panko chicken breasts with a big heaping Meyer lemon vinaigrette arugula salad atop it for supper. A quick stop into our fab neighbor next to the First & Spring shop, Cone & Steiner, produced this easy French table wine that would be perfect with the meal. And indeed it was. From the maker: 6 hectares of old Cinsault vines on our beautiful sandstone sites. The vines come from field selections conducted in the Châteauneuf-du-Pape region at the start of the 1960s. 90% Cinsault, 10% Syrah Red Fruit Défendu comes from a part of the vineyard where the grapes are smaller and more concentrated. The fruit is entirely destemmed and fermented in concrete tanks with pumping over and punching of the cap. Vatting duration is short, at 10-12 days, and all the grapes are picked by hand. The perfect complement to all grilled foods as well as white meats such as roast guinea fowl, rabbit with mustard and Normandy-style poultry or veal. SO happy to report our Market shop shelves are re-stocked with boxes of Roger & Gallet soaps and Eau de Toilette sprays. We have carried these for close to 20 years and we were unable to get them for over a year now. This iconic French brand from Paris is a winner for both men and women. Most of the scents enjoyed by all. I personally love the detail of the tissue paper, each bar wrapped just so. The boxes make for easy, stylish gift giving. I find it fascinating and comforting knowing what makes up a day, when reflecting on it the following day–all the little bits & bobs that occur, all the interactions, the food eaten, the conversations. One other way in this modern age is looking back at images. 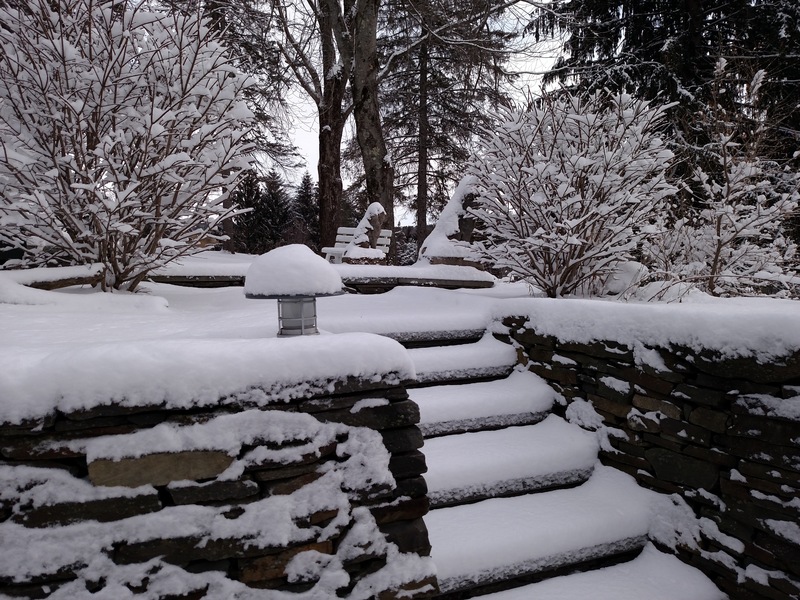 I woke up yesterday to this image in an e-mail from caretaker Bill. He knows how much we love the snow and a fresh dusting occurred. The lions looking regal standing at attention keeping watch with a coat of snow. The day was full of meeting folks for interviews for the new position we have opening up at Watson Kennedy. 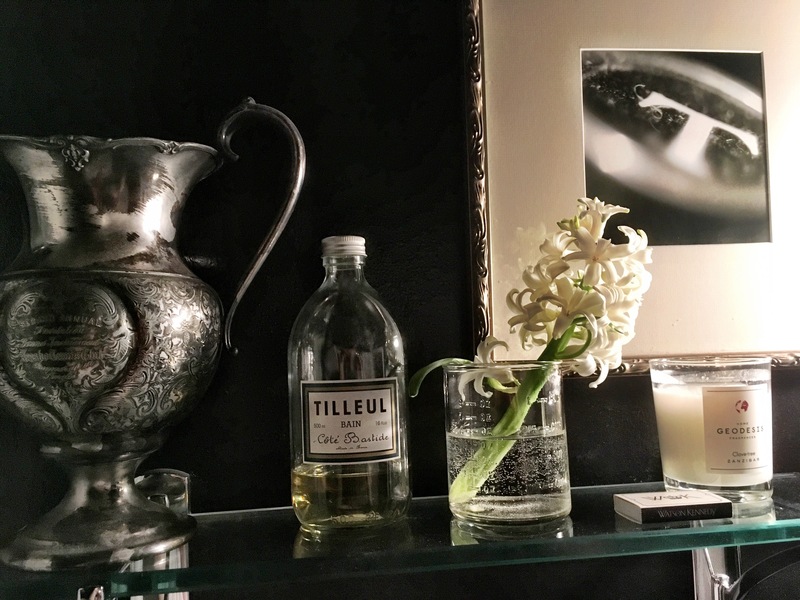 But I snapped the above image right before I left the apartment as one of the hyacinth from the image I posted yesterday had grown so tall and fallen over, so I clipped it and the bloom now lives by the bathtub. White flowers against the black walls are a soothing contrast I find super visually appealing. Not only were interviews taking place, but lots and lots of new product is arriving from lines I found last week at The Fancy Food Show, so there has been a flurry of unpacking activity taking place. 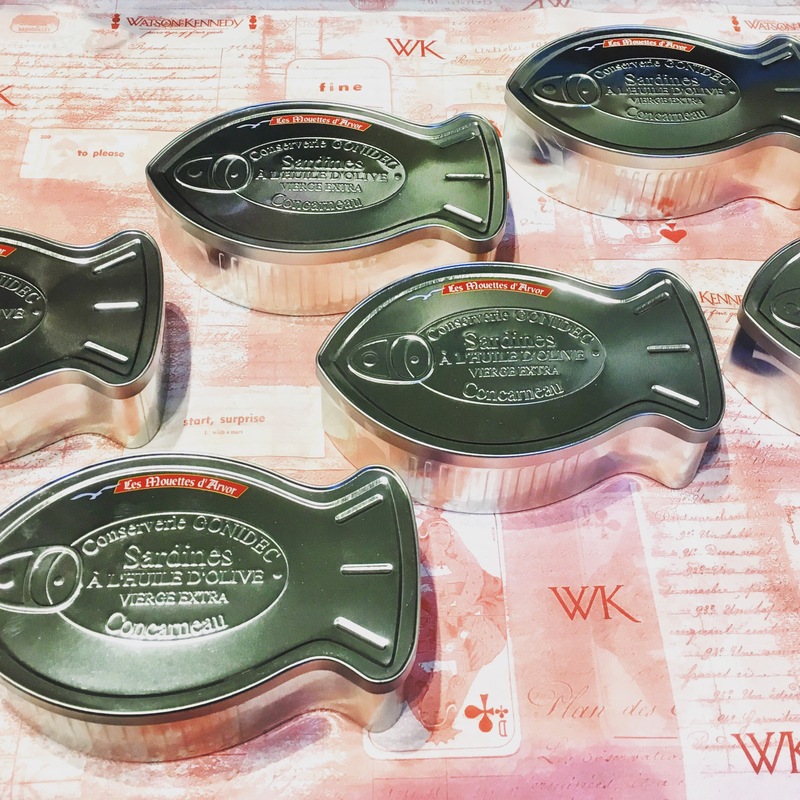 I could not resist snapping these French sardine tins from Brittany. Each filled with two cans of olive oil packed sardines. That was my day in images. A full, fun day filled with tons of variety and entertaining to see what ended up being documented in photos. Hope your Saturday is grand! 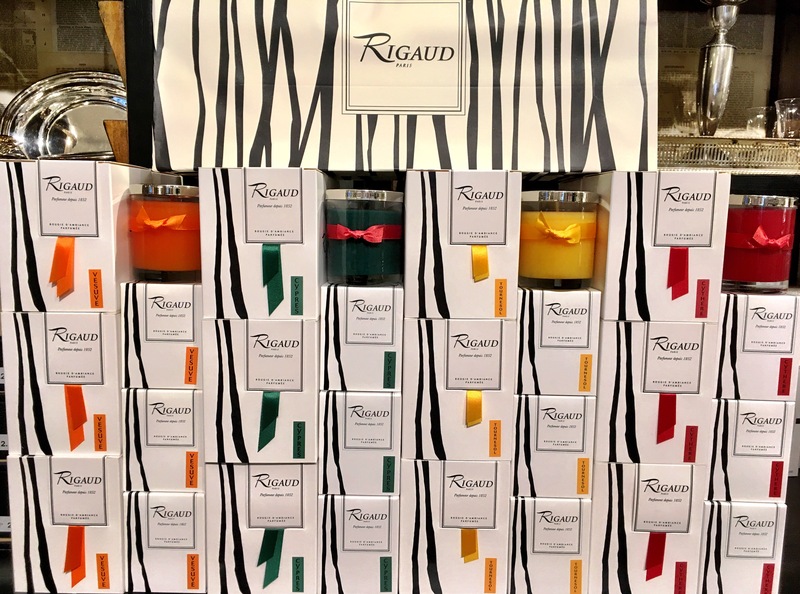 We are pleased to announce that we will once again be stocking the renowned French candles, Rigaud, at Watson Kennedy. When we first opened our doors in 1998 in the Market, we carried the line, but then the importer went away and we could no longer get the candles. Fast forward to today and they are once again on my radar, with our new shipment arriving yesterday. These are a true ‘Classic’ with a cap C.
A little history from a little web searching: Riguad was the first luxury candle ever created. Rigaud candles began in the 1850’s when the Rigaud family started a perfumery. They gathered rare plant essences from around the world to create unique, exquisite perfumes. In the 1960’s, Madame Rigaud had the Cypres candle created for her to burn in her fashion boutique on the Champs Elysees in Paris, France. Customers raved over the fragrance and the Riguad candle line was born. President Charles de Gaulle gave the Rigaud Cypres candle to First Lady Jacqueline Kennedy. She loved the candle so much she had the line brought over to the states and the rooms of the White House were filled with Rigaud candles while the Kennedy’s were in office. Just In, our beloved towels arrived from France the other day. 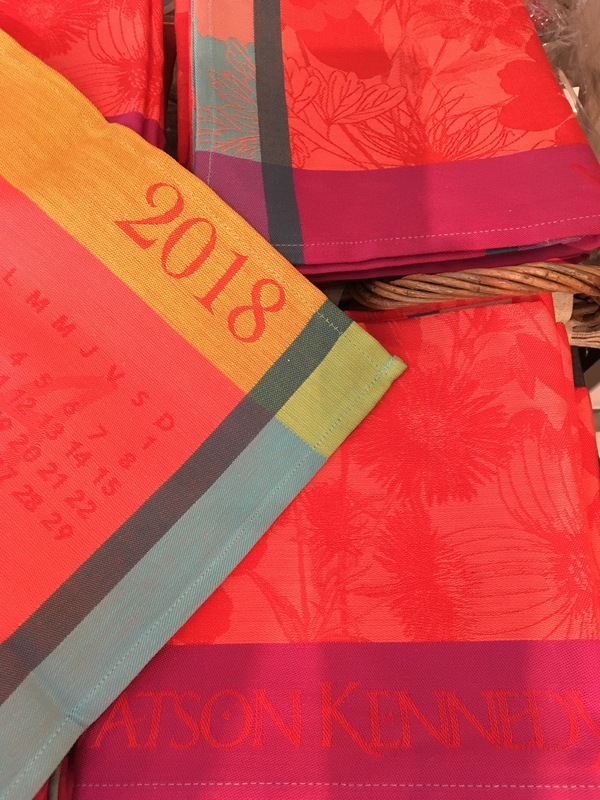 Box after box filled with our Le Jacquard Francais 2018 calendar towels. Each year they arrive a bit earlier and each year I order more & more and each year we sell these beauties out earlier. I love how many have started a collection over the years. They make stellar gifts too. We had the great pleasure of watching LJF towels being made at the factory in France years back. What an amazing process. Might just be the best $26 value we have in the shops, as these dishtowels are workhorses, while looking pretty darn swell in the process. I have been so excited to get my hands on this book since I first started hearing/reading about it a few months ago. Yesterday was the release date and happy to report we have a lovely stack of them at the shops. France: Inspiration du Jour by the ever talented Rae Dunn. The tag line is ‘An Artist’s Sketchbook’ which it really looks & feels like, which I quite love. It is what makes this book so special. I have long been a fan of Rae and her work in clay, carrying her original work at the Fine Home shop when we first opened and later her produced works for the last many, many years. 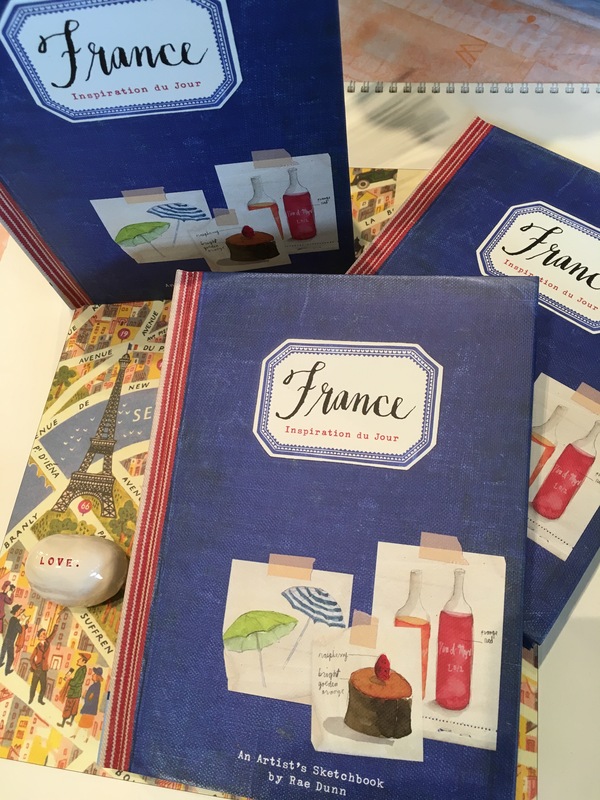 Inspired by her time in France, this book is filled with her drawings, notes, thoughts, photos. From her foreword: “I feel particularly connected to France because I share the sensibilities, aesthetics, and quality of life of the French.” I could not agree with her more, feeling very much the same way. For those of you who share in this, her new book will be a happy respite whenever you need a little sojourn without the jet lag. 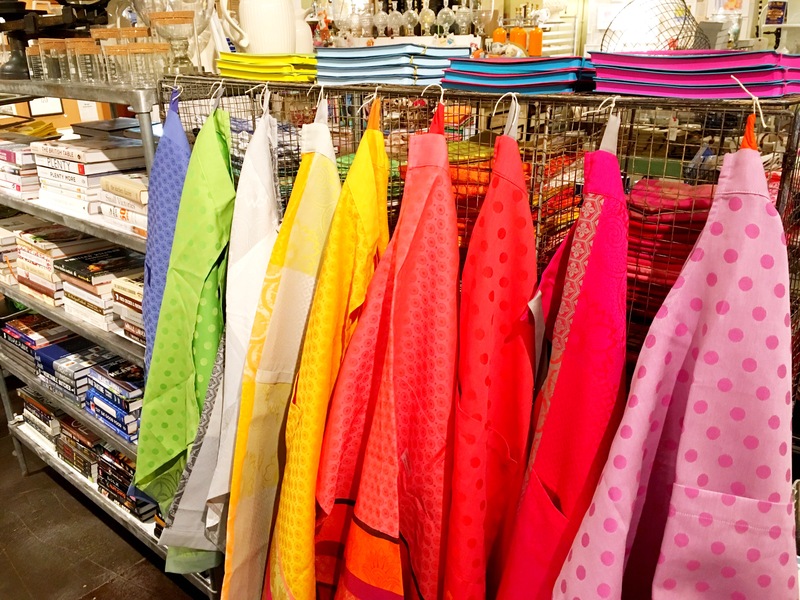 Just In, a happy colorful grouping of aprons from Le Jaquard Francais. They came perfectly pressed & package in these nifty clear envelopes, but we just really wanted everyone to see all the glorious color and variation in these beauties, so we hung them all. LJF is known the world over for their beautiful patterns and use of vibrant color, and that is just what these aprons bring to the table. Spiffy for both men and women who want to up their culinary wardrobe.